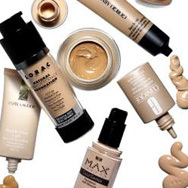 Searching for the best foundation makeup to suit your skin colour, skin type, coverage needs, and other personal preferences can feel like an endless quest. Let us help you discover the benefits of the different types of foundations so you can find your perfect match. Just because a foundation looks great on your friend or looks like a good match in the bottle, doesn’t mean it’s going to be the right fit for you. It’s extremely important to choose a foundation that balances the needs of your particular skin type and skin concerns, and matches your skin colour perfectly. Foundations with a matte finish can exaggerate flaky skin or wrinkles if the finish is too dry. You can remedy this by applying a light layer of moisturiser or a serum underneath, although that can reduce the matte aspect of the finish. Not the best option for oily skin because the moisturising finish makes oily areas look even more oily. Excellent for use over a daytime moisturiser with SPF to reduce the shiny finish of some sunscreens. Powder’s pigmentation can change when it mixes with skin’s excess oil and oxidises. The sheer nature of tinted moisturisers (and many BB creams) makes it easier to match skin colour because they tend to blend on almost invisibly.